The Big Melt is a feature length elegy to the men and women who toiled in Sheffield's steelworks during the last century, and a hymn to Britain's proud industrial past. Working together, Sheffield's own musical hero Jarvis Cocker and acclaimed director Martin Wallace have produced an exquisite audio-visual tapestry using archival footage drawn from the BFI National Archive. Following its broadcast in BBC Four’s Storyville strand in January, The Big Melt will be released by the BFI on DVD on 17th March 2014 with extensive extra features at the RRP of £19.99. 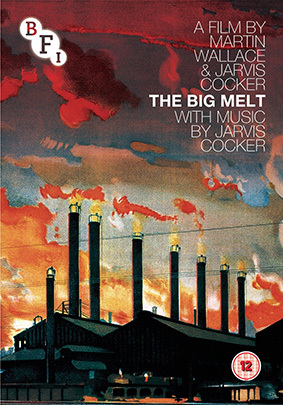 Jarvis Cocker provides the film's stirring musical accompaniment, collaborating with a raft of Sheffield's finest musicians, including a string quartet, the City of Sheffield Brass Band, members of PULP, Richard Hawley, The Forgemasters, harpist Serafina Steer and a youth choir. Specially commissioned by Sheffield Doc/Fest – the UK’s premier documentary and digital media festival – as part of the 100 Years of Stainless Steel celebrations last year, The Big Melt was premiered at Doc/Fest on 12 June 2013 where the score was performed live. That exciting event at the Crucible can be seen here, amongst the special features, which include interview footage with Jarvis Cocker and Martin Wallace, both of whom have also contributed to the accompanying booklet.